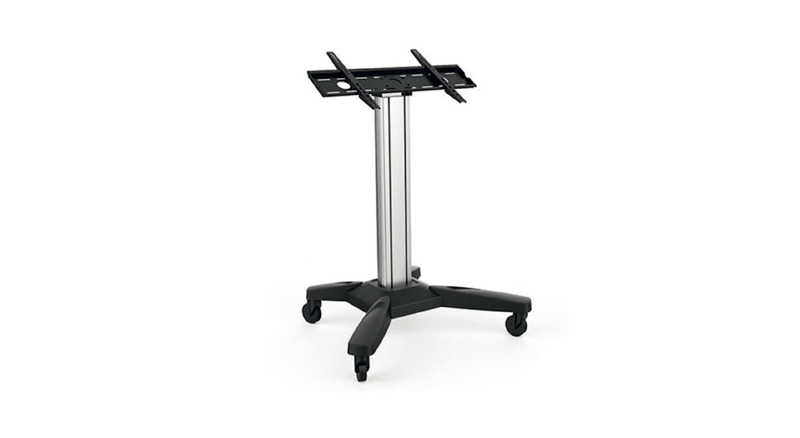 Elegant, technical and functional aluminum floor stand designed to provide a solid solution for presentation, compatible with most 37 "to 70" LED / LCD monitors. Total height 1,125 m. The TV support allows you to effortlessly adjust the tilt down (from 45° to 90°) for an optimum viewing angle that ensures perfect viewing, in addition to the possibility of using the touch monitor as an interactive table. The line is complemented by optional accessories, including shelf for camera, DVD, PC case, Laptop/ DVD/AV security box and power socket that ensure fast and easy mounting. The sturdy base with reinforced design, supports the entire weight of the equipment. An integrated cable gland keeps the various connecting cables in full order. Ideal for videoconferences, public and professional presentations.